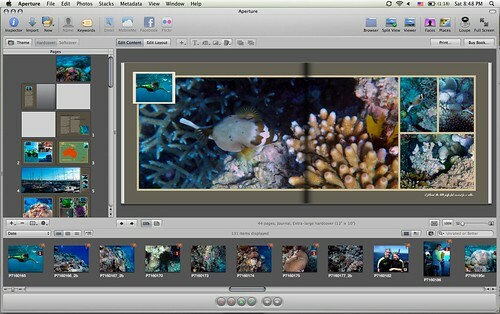 Apple's Aperture is not solely a photo book design tool, it is a photo editing and photo management software program first released in 2005. 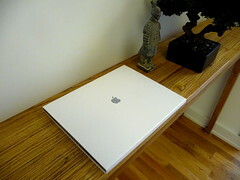 The most recent version is Aperture 3 released in Feburary 2010 and retails for $199, however a free 30-day trial of this program is available for download on Apple's site which gives a good opportunity to test out its photo book creation software. Note this program is only compatible with Intel-based Macs running an operating system of Mac OS X v10.5.8 or v10.6.2 or later. Although, Aperture's other features are not the main focus here, the program also allows you to create multimedia slideshows with music and video, no doubt borrowing similar features from Apple's iMovie. It also takes iPhoto's editing and photo management tools to another level. Aperture has an enhanced face detection technology to help organize photos of the same person and also captures GPS data from cameras with that function to automatically geo-tag your photos and arrange them on a map. 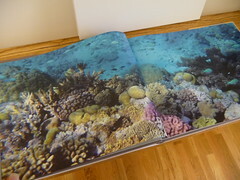 Of more potential interest to photo book enthusiasts, is the ability to edit and enhance your photos. While other free photo book software has limited capability to edit photos, Aperture accordingly has more precise tools allowing you to adjust levels, tint, contrast, color, saturation, retouch etc. Serious photographers still appear to prefer Adobe Photoshop however, acknowledged by many to be the gold standard of photo editing. Aperture's edits are non-destructive meaning an original untouched version of your photo is always stored and remains unaltered. Similarly the program automatically saves versions of your photo book while you're creating it. 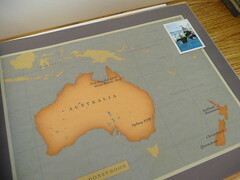 Offers special company specific plug-ins from high-end photo book printers. The professionally designed templates and themes help speed up the book layout process. 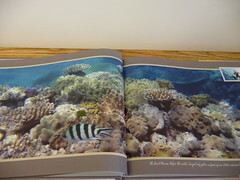 You can easily create the coveted two-page spread (where a single photo stretches across both pages of the book). Several preset layouts feature the two-page spread with drag and drop capability. 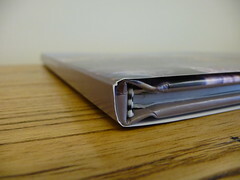 Hardcover books include with no extra charge, a customizable dust jacket as well as full custom cover printed directly onto the surface of the book. Extensive photo editing can be done directly from the book making software. Click HERE to go to Apple Aperture's site! Don't forget to check the main Photobook Deals page for all of today's deals! Bookmark that page or fan me on Facebook and you won't miss out on the latest coupon codes! Save money with the latest Apple Aperture coupons and deals, or see if there are any Apple Aperture groupons. 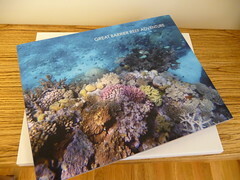 Jul 16, 2010: iPhoto vs Aperture - Is There a Difference in Photo Book Print Quality? Thinking about designing a photobook on Apple Aperture? You can view a detailed chart of every Apple Aperture photo book, including sizes and pricing. See the full list of Apple Aperture photo books.